The eardrum helps in hearing. When sound waves enter the ear, the eardrum vibrates. 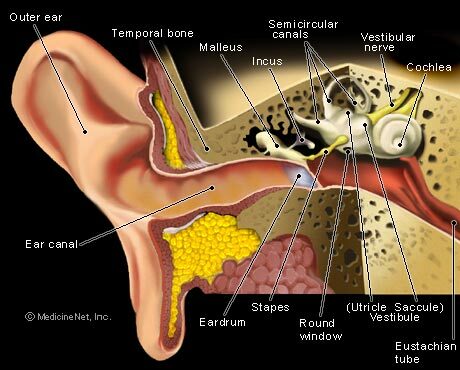 These vibrations from the eardrum pass through the small bones (ossicles) inside the middle ear. The ossicles amplify the vibrations and pass them on to the inner ear. The eardrum also forms a protective barrier that prevents germs and bacteria from entering the middle ear. A perforated eardrum is a hole or tear in the eardrum. The eardrum, also known as the tympanic membrane, is a thin layer of tissue that separates the outer ear from the middle ear. There are several possible causes of a perforated eardrum. The most common cause is an infection of the middle ear. It can also be caused by a loud noise or injury to the ear. In severe cases, surgery may be required. A revolutionary surgical technique for treating perforations of the tympanic membrane (eardrum) in children and adults has been developed at the Sainte-Justine University Hospital Centre, an affiliate of the Université de Montreal, by Dr. Issam Saliba. The new technique, which is as effective as traditional surgery and far less expensive, can be performed in 20 minutes at an outpatient clinic during a routine visit to an ENT specialist. The result is a therapeutic treatment that will be much easier for patients and parents, making surgery more readily available and substantially reducing clogged waiting lists. "In the past five years, I've operated on 132 young patients in the outpatient clinic at the Sainte-Justine UHC using this technique, as well as on 286 adults at the University of Montreal Hospital Centre (CHUM) outpatient clinic," says Dr. Saliba. "Regardless of the size of the perforation, the results are as good as those obtained using traditional techniques, with the incomparable advantage that patients don't have to lose an entire working day, or 10 days or more off school in the case of children." The technique, which Dr. Saliba has designated "HAFGM" (Hyaluronic Acid Fat Graft Myringoplasty), requires only basic materials: a scalpel, forceps, a probe, a small container of hyaluronic acid, a small amount of fat taken from behind the ear and a local anesthetic. The operation, which is performed through the ear canal, allows the body by itself to rebuild the entire tympanic membrane after about two months on average, allowing patients to recover their hearing completely and preventing recurring cases of ear infection (otitis). Because it requires no general anesthetic, operating theatre or hospitalization, the technique makes surgery much more readily available, particularly outside large hospital centres, and at considerably lower cost. "With the traditional techniques, you have to be on the waiting list for up to a year and a half in order to be operated on. Myringoplasty (reconstruction of the eardrum) using the HAFGM technique reduces waiting times, cost of the procedure and time lost by parents and children. What's more, it will help clear the backlogs on waiting lists," Dr. Saliba says. Myringoplasty is surgical procedures to repair the tympanic membrane or eardrum when it has been perforated or punctured as the result of infection, trauma or dislodgement of a myringotomy tube (also known as a pressure equalization tube). Surgical repair of the perforation will allow the patient to recover his or her hearing and prevent repeated ear infections, particularly after swimming or shower. Traditionally, these procedures are performed using what are known as lateral and medial techniques, which require hospitalization for at least one day, and 10 to 15 days off work. Every year in Quebec, some 750 myringoplasties are performed on adult or child patients.